The release date for Anthem is just around the corner, but EA and Bioware aren’t done showing us sneak peeks. At The Game Awards 2018 we got a chance to see the first Anthem story trailer, which finally gives us a look at what the story is going to be about in more details. Thanks to the trailer, we have an in-depth explanation of what the games name is referring to. The Anthem of Creation is a power in Anthem‘s world that represents the energy left behind by the gods. When the gods left the planet, their power stayed in the form of the Anthem. This power can create and destroy and can be harnessed using rare artifacts. When you play, you’ll take the role of one of the Freelancers. This group pilots suits called Javelins and protect the world and its colonies. The bad guys are called the Dominion, just like in Star Trek Deep Space Nine. 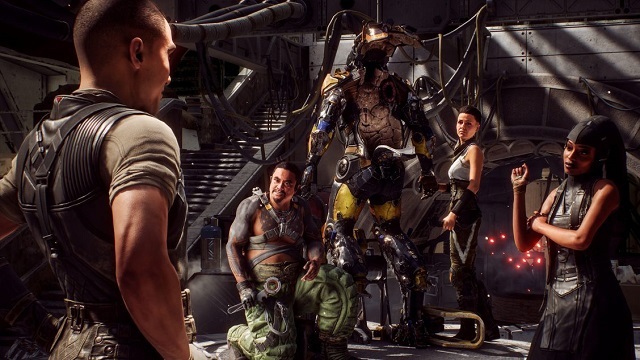 Unlike Star Trek’s Dominion, Anthem‘s bad guys aren’t made up of shapeshifters, but they’re similar in that their goal is peace through the use of overwhelming force. The leader of the Dominion is called the Monitor. It’s the Monitor that wields the Anthem of Creation for nefarious reasons using a powerful artifact. We also got to meet some of the Freelancers. Halek, Faye, Tassen, Brin, and Owen will all support your efforts and reside with you on the airborne base, Strider. We got to see a bit of their personalities and the roles they play in the team. The game will release on PC, PS4, and Xbox One on February 22. Before then you can get a chance to play in an open beta on February 1-3. Additionally, those who pre-order the game will get a VIP demo on January 25-27.